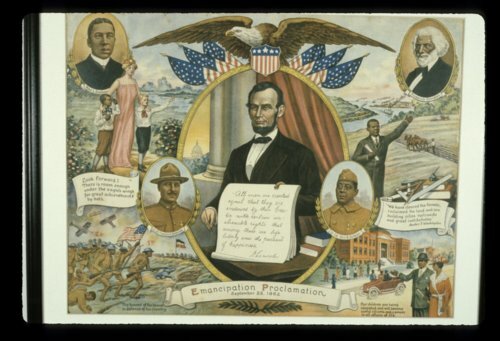 This slide of a broadside shows President Abraham Lincoln in the center with Frederick Douglass and Lieutenant Colonel Otis Duncan to his right. To Lincoln's left is Lieutenant Colonel Franklin A. Dennison and Paul L. Dunbar. Supplementing the portraits in the broadside are civilian and military scenes. The broadside was created during World War I to focus on civil rights for African Americans in the United States.